Many wedding planners endure the meticulous task of creating the most memorable experience for their bride and grooms. Whilst the most picky of clients challenge their planner they often neglect some areas of the reception where they may otherwise consider just a secondary behind-the-scenes addition such as, THE BAR! Have you been to a wedding reception to get a drink to find the bar hidden amongst trails of heavily accessorized pathways, or in a dark corner? Wedding receptions are the highlight of the occasion for many guests. After a long ceremony, the final hours of the celebration are enhanced with beverages of all kinds, spirits of many flavors, and this conglomerate of serving activity is where much of the attention is gained in making long lasting memories. Now why on earth should this section of the gathering be anything less than a polished classic connection to the bride and groom? 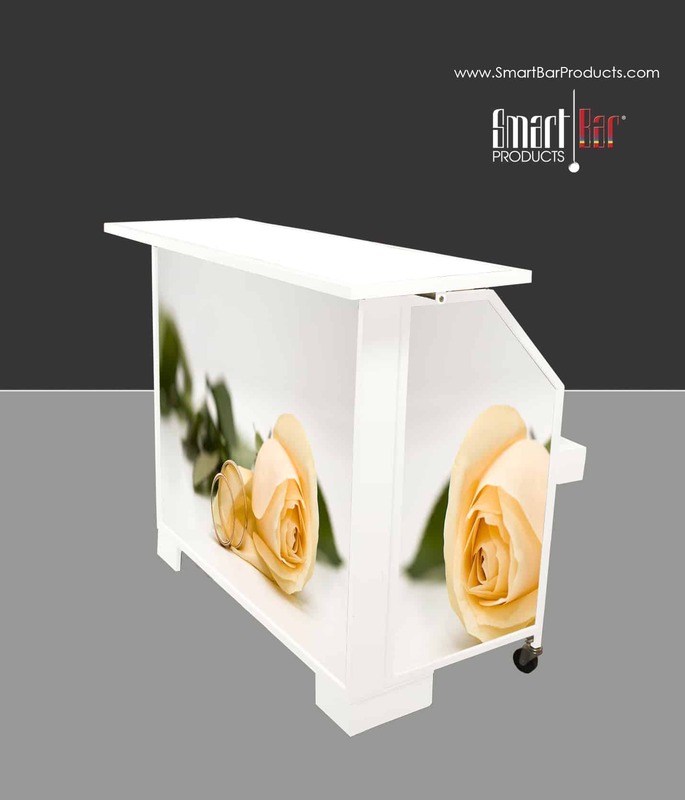 Here are a few wedding bar customization ideas based on the ol’ tradition “Something Old, Something New, Something Borrowed & Something Blue…” This can certainly be applied to a customized SmartBar 5L! As for something old, you can take an old piece of material or lace fringe that belonged to the bride’s Mother and incorporate specific details onto the SmartBar panels as enlarged and faded to create a background. Or use the detail along side the metal frame to give it an accent trim. As for something new, customize the SmartBar with the bride and groom’s name in fanciful italic or script fonts! You can also show a photo of the bride and groom on the panel along with their name and ceremony date to give the bar an extra personalized touch. As for something borrowed, here’s a very unique bar design idea if the borrowed item happens to be the cake cutting knife from an aunt or friend. Most wedding cake knives are decorated at the handle with an ornate pattern. You can take that pattern and show it on the SmartBar panel trim and colorize sections of the pattern with the bride’s maids dress colors. This bar customization idea would pull the borrowed concept from not only one place but two! And as for something blue, the possibilities for SmartBar panel designs are endless – but to illuminate in blue, that is an effect most other bars are incapable of offering. LED lighting has a smooth spread – you can light up the SmartBar in a steady glowing blue for hours.